Discussion in 'Parallel Universe' started by Y E T I, May 8, 2010. My battery was starting to take a bit of effort to start my bike and I've been wanting to replace the stock battery with an Odyssey PC535 for a while so I decided to do it this morning. My battery was delivered last week for about $125. First thing was to make sure it was fully charged and do a size comparison. Here's the Odyssey side-by-side with the stock Exide. First thing was to remove the stock battery. 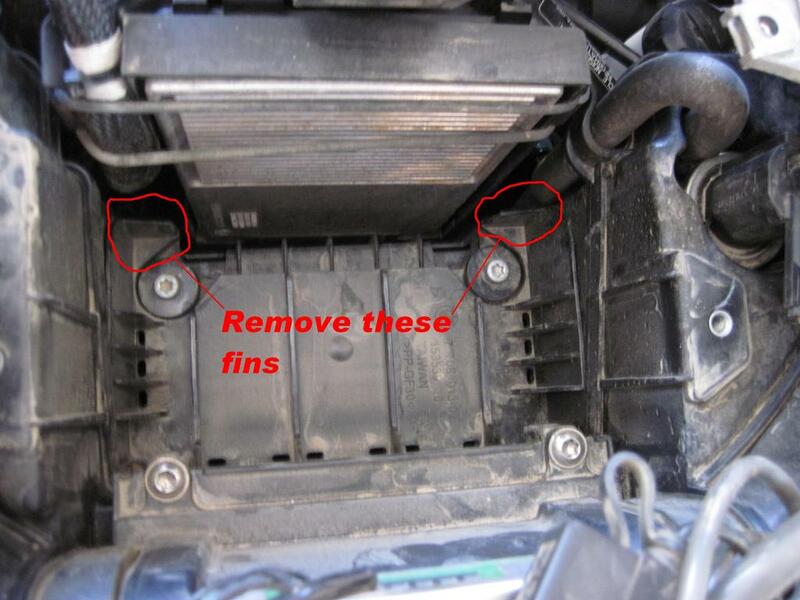 There are two T30 Torx bolts on either side of the battery which hold down the plate. You can barely see one of them on the right side, the other is covered by wires. Then unhook the battery connections and remove the battery. Easy. Just as I finished I got a flyover by these guys. This is only a few of the planes. 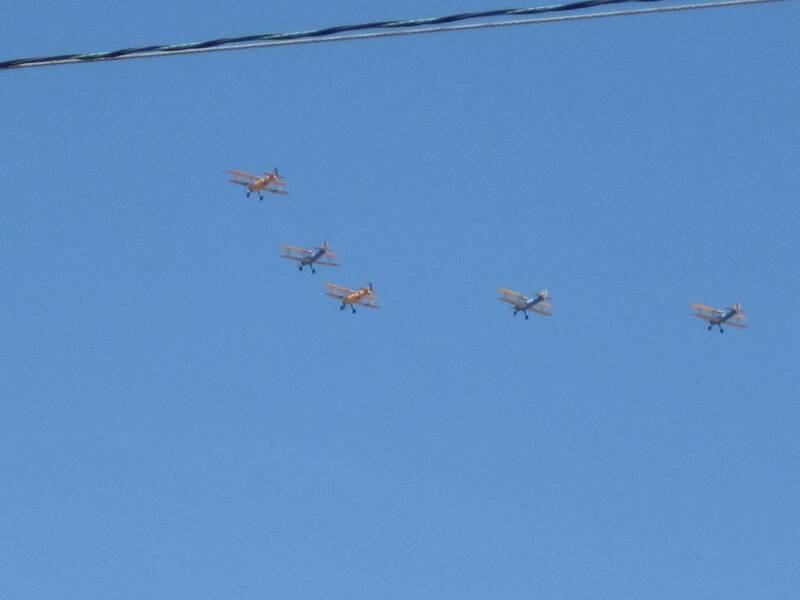 There were probably 30 total, with a bunch of them being bi-planes. Totally cool!! With the front fins removed the battery just dropped right in. I kept the brass connecter on the positive terminal since I couldn't bend the wires the right way, but removed it from the negative terminal and connected the wires directly. I also made a strap from an offical BMW tie-down strap. (Thanks for the idea Joel!) Looks like this installed. Then I just buttoned everything back together and fired her up. The bike fired right up and seems happy as a clam. I need to have the dealer re-set the service light but everything else is good to go. It took me about an hour and a half total but most of that time was spent trying to figure out how to remove the battery tray to cut the tabs off cleanly. I gave up and went with the "bigger hammer" method instead. It should have only taken me a half hour or so. Maybe a dremmel tool with a cut-off wheel would do the trick? I tried but I just couldn't get it in there. The battery box just isn't wide/deep enough to get the right angle. That's why I was trying to get the battery tray out. I was about to start pulling the airbox to get to it when my wife started doing the ":ddog I thought this was a half hour project . . ." At that point I decided to just cut and run. And yes I was using the small attachment thingy, not trying to stuff the whole Dremel down in there. The Odyssey is head and shoulders better then any other battery I am aware of. 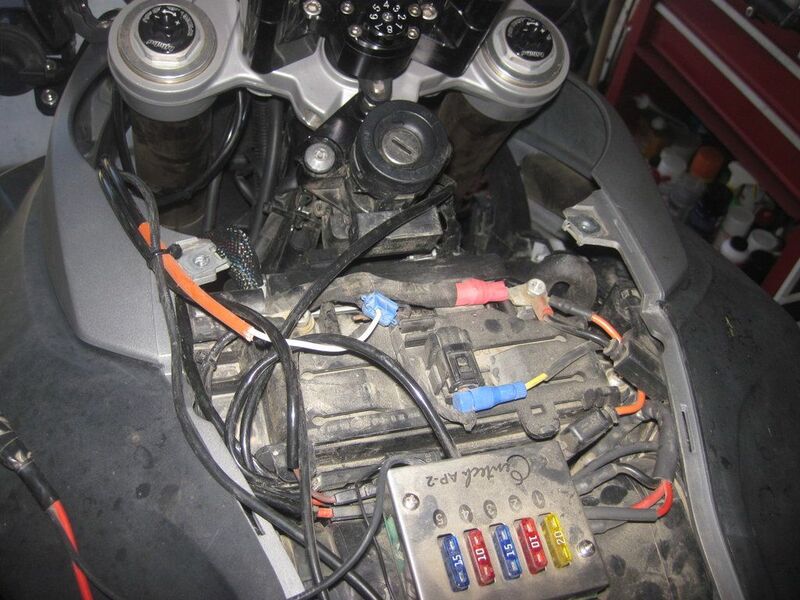 The only piece of the bike you need to modify is the battery tray. If you wish to do a clean job, a sharp wood chissel works, or you can remove the airbox and slide the battery tray out of it for easy access. 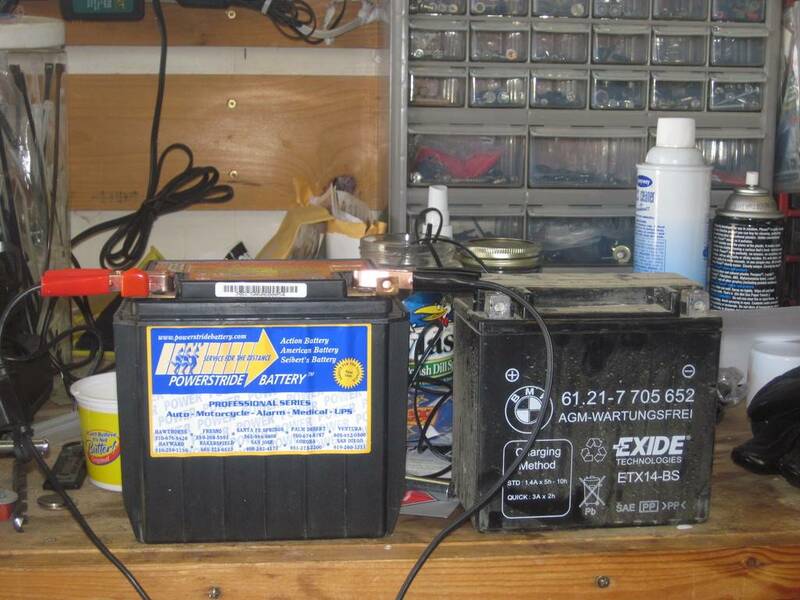 If your worried about modifying any part of the bike, a new battery tray is really cheap. 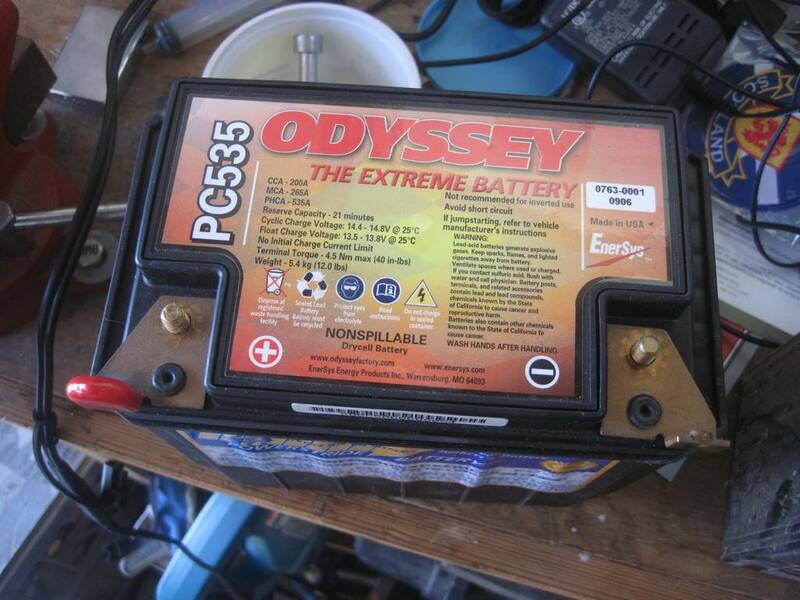 If your battery is failing because it is never getting fully charged, run down by excessive loads, or run flat by the CAN bus because you have hooked up something it doesent like, the odyssey will eventually fail as well. The odyssey is however a much tougher battery, and with more cranking amps as well. Yup, what Joel said. Perfectly happy with my Odyssey so far. Even started the 800 after I left it sitting over Sunday when I rode the 400. Any idea of the life expectancy of the odyssey versus stock? My stocker is going on 1.5 years old and while it hasn't given me any problems I'm thinking about installing and odyssey rather than waiting to get stranded and having to settle for an off the shelf battery that is available at that time. I've never had a stock BMW battery last longer than 1 1/2 years. I commute just about every day and if the bike is going to sit more than a couple of days it goes on the tender, so I figure my batteries live easy lives. The problem is, they tend to die sudden and unexpected deaths rather than giving you any warning. Had I known I think I would have gone with the Westco. Oh well . . .
Oh, and I would have bought it from Rob, great guy with great service.